The Forum’s Peter A. Wollitzer Advocacy Award was established to honor a colleague who has been remarkably effective in influencing institutions of higher learning to understand and support education abroad through the promotion of The Forum’s mission: developing and disseminating comprehensive standards of good practice, resources and training, advocating for education abroad and its values, and engaging the field in critical dialogue. The award will be given to an individual, but individual achievement pre-supposes institutional efficacy and impact and provides inspiration to the field of education abroad. Awardees must be employed by a Forum member organization. The award is presented each year at The Forum’s Annual Conference. The deadline to submit nominations for the 2019 Award is December 14, 2018. Nominees must be employed by a Forum member institution or organization. Nominations must be made by colleagues employed by Forum member organizations. Nominations must be made using the web form linked above, and should include at least a second reference. A resume or C.V. and additional letters of support are also welcome and should be uploaded . Peter A. Wollitzer was Regional Director for Asia and Africa of the University of California Education Abroad Program. Before joining EAP in 1986, he was Assistant Director of UC Berkeley’s Institute of International Studies. Earlier in his career, he also served as Program Officer with the Institute of European Studies (IES) in Chicago. Peter earned his doctorate at The Pennsylvania State University in Higher Education/International Studies and his B.A. and M.A. degrees at the University of California, Santa Barbara and Berkeley respectively. Peter served on many international task forces and boards, most recently being elected to the Advisory Council of The Forum on Education Abroad and serving as its first Chair (2002-2005). During his three-year term, he organized the Council’s governance procedures and structures as well as its major activities which included the widely hailed project on Standards of Good Practice, two student research competitions, a national survey on curriculum integration and two conferences. All of these projects took place while Peter was being treated for the brain cancer that ultimately took his life. Peter was also a member of the CIEE Academic Consortium Board. He wrote and presented on a wide range of subjects related to international and higher education in Europe and Asia. Peter was an outspoken and untiring international educator who believed in programs that give access to all qualified student to different sources of knowledge available worldwide, to special pedagogical methods and field study opportunities, and, of course, to widely varying cultural, social, political, and economic environments. He was skilled in working with faculty and administrators abroad and extremely creative in designing new programs between UC and partner institutions, believing that collaborative relationships could assume new dimensions when focusing on academic integrity and high standards. This abbreviated biography reflects the intellectual and exciting nature of his persona and his ability to reach out to those around him and to show his pride and deep commitment, belief, and dedication to international education. Those of us who had the pleasure of working with Peter admired his courage and his dignity when facing his disease. He will continue to be a force and an inspiration to many in the field of international education in the days to come. The Forum’s Peter A. Wollitzer Advocacy Award will ensure that his name and his legacy live on in perpetuity. Kathleen Sideli (center) with nominators Martha Johnson (left) and Mary Dwyer (right) at the 14th Annual Conference in Boston. 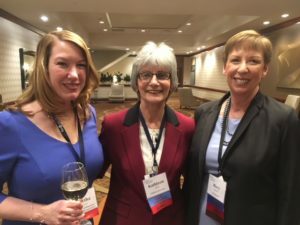 The 2018 Wollitzer Award was presented to Dr. Kathleen Sideli of Indiana University at The Forum’s 14th Annual Conference in Boston, MA. Sideli is Associate Vice President for Overseas Study at Indiana University, where she also taught in the Department of Spanish and Portuguese for twenty-five years. She was The Forum’s first President and Chair. 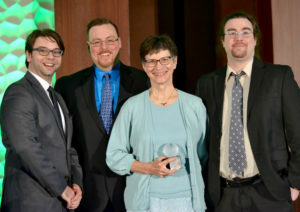 Dr. Margery Ganz was awarded the Peter A. Wollitzer Advocacy Award at The Forum’s 13th Annual Conference in Seattle, WA. Ganz served as the Director of Study Abroad & International Exchange and Professor of History at Spelman College, and retired in July 2017 after 36 years of service to the field. 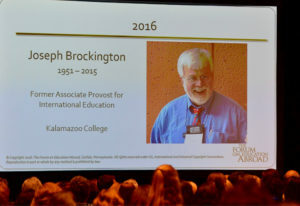 “Throughout his twenty-plus years in international education, Joe Brockington consistently contributed to and advocated for the Standards of Good Practice for Education Abroad, mentoring colleagues at institutions on how to develop and provide programs incorporating The Forum’s Standards that met curricular goals while also fully supporting students. His contributions to the research of the development of the profession of international education helped to create recognition of the increasing professionalization of our work while acknowledging how much the field has changed. Throughout his career, Joe never missed an opportunity to remind colleagues that having standards was so important because, as he would say in his very Midwestern, dry, humorous tone, ‘that next to parenting, education abroad is the world’s greatest amateur sport. '” Click here to read Wiedenhoeft’s full citation. Brockington, a member of the founding Board of Directors of The Forum, passed away in August 2015. He served as associate provost for international programs and professor of German language and literature at Kalamazoo College. He was instrumental in the founding of The Forum and over the years contributed to the field in innumerable ways by presenting at conferences and initiating projects. 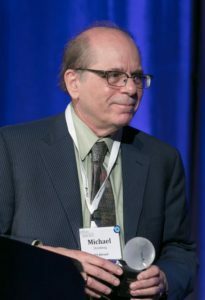 Michael Steinberg, Executive Vice President of Academic Programs for IES Abroad, received the Peter A. Wollitzer Advocacy Award at The Forum’s 11th Annual Conference in New Orleans. Steinberg was presented the award by Tracy Williams, Texas Christian University, a member of the Wollitzer Award Selection Committee. Other members of the Committee were: Patti Brown, IFSA Butler; Jim Buschman, New York University; Enda Carroll, University College Dublin, representing the Board of Directors; and Alicia Stanley, Northwestern University, representing the Council’s Advocacy Committee. Congratulations to Liam Ó Dochartaigh, former Director of International Education at the University of Limerick, who was awarded the Peter A. Wollitzer Award on April 5, 2013. Enda Carroll, Centre for Study Abroad Manager at University College Dublin, presented the award to Mr. Ó Dochartaigh at the Forum’s Ninth Annual Conference in Chicago, Illinois. 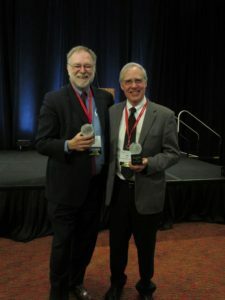 The Forum proudly congratulates this year’s two recipients of the Peter A. Wollitzer Advocacy Award, Jon Booth, Executive Director, Syracuse University Abroad, and Michael Vande Berg, Vice President for Academic Affairs, CIEE. Jon Booth’s award was presented by Michael Calo of Syracuse University, and Mick Vande Berg’s award was presented by Martin Hogan of CIEE. 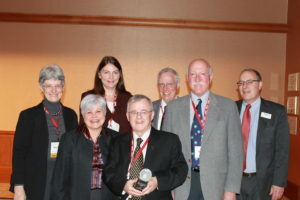 On April 8, 2011 Dr. Susan Pugh, emeritus associate vice provost for enrollment management and director of student financial assistance at Indiana University, was awarded the Peter A. Wollitzer Award. Kathleen Sideli, associate vice president for overseas study at Indiana University, remarked for the conference attendees that Susan Pugh defined for the field of education abroad the highest standards of good practice regarding financial aid. Dr. Pugh embraced the cause of widening the availability of financial aid to students going abroad by promoting the concept among organizations in her own field, such as the National Association of Student Financial Aid Administrators. Until that time study abroad was not widely seen by either financial aid administrators or federal education officials as an integral part of an undergraduate degree program. Her advocacy efforts helped change that perception. The Forum is proud to congratulate the recipient of the 2008 Wollitzer Award, David A. Larsen, founding Board member of The Forum and Vice President and Director of Arcadia University’s Center for Education Abroad. Lorna Stern Laniak’s warm citation for Dr. Larsen spoke of the breadth and depth of his service, and led to a rousing ovation. Dr. Larsen provided some words of appreciation. The recipient of the Wollitzer Award in 2007 was Professor R. Michael Paige, of the University of Minnesota. 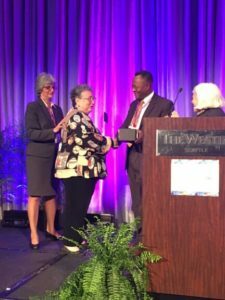 Diane Elton’s award citation, presented at The Forum Conference in Austin, TX, noted Dr. Paige’s many achievements, accomplishments and dedication on every level to education abroad. The first Wollitzer Award was presented posthumously to Peter Wollitzer himself. Peter was the Forum Advisory Council’s first chair, and was instrumental in helping to develop the Standards of Good Practice, the Council’s governance procedures, and much of the Council’s early work. He did all this while working as Regional Director of Asia and Africa of the University of California Education Abroad Program, serving on the CIEE Academic Consortium Board, and while being treated for the brain cancer that ultimately took his life. Read the introductory remarks from the 2006 Annual Meeting.